The Nikon digital single-lens reflex cameras can be both superb conductors to the world of digital photography for beginners and reliable confreres for professional photographers. A wide range of the Nikon digital SLRs enables you to select the one that fits your needs, your wishes and, importantly, your financial opportunities. If you are just beginning an exciting journey into the world of digital photography, and your budget is limited, then the Nikon D40 is designed specifically for you. Its compact body contains modern technical solutions, which allow you to obtain high quality pictures. Do you want anything "more serious"? Then you should pay attention to the Nikon D60. Lightweight, compact, easy to operate, but, nevertheless, capable of solving almost any creative task, the D60 will take you from novices of digital photography into the category of advanced amateurs. And if you are dealing with digital photography not the first day, then it is for you, that Nikon produces the Nikon D80 camera, which can help you to make a step-up from a budget camera. The Nikon D80, launched in September 2006, is a kind of link between amateur and professional digital SLRs, manufactured by Nikon. 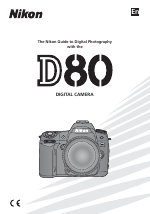 The D80 design is traditional for Nikon digital SLR cameras. The layout of the controls resembles the D200 and the D70. However, compared to its predecessor, the D80 body has softer, more rounded contours. The camera fits nicely and reliably in your hands. It is equipped with a large 2.5-inch LCD screen with a viewing angle of 170 degrees. High brightness and clarity of the display not only simplifies navigation through menus, but also allow you to conveniently view images and evaluate their quality, which is very important, given the availability of such function as post-shooting editing of photos in the D80. The Nikon D80 CCD sensor has a resolution of 10.2 megapixels, which allows you to take sharp and well detailed pictures. But the "heart" of the system is a new high-speed image processor, which processes images from the matrix. The principle of the processor operation is similar to devices used in professional models. The image information is supplied from the sensor to the processing device via two independent channels (original information is divided into color components), which is converted into a digital signal by 12-bit processing algorithm. Then the digital data of the color and tone are mixed and processed so as to ensure an accurate color-and-tone output, as well as needed sharpness, contrast, brightness, and other parameters of the image. Due to the same processor continuous shooting speed is 3 frames per second. The Nikon D80 is fully compatible with almost all ever issued autofocus Nikkor lenses. The D80 provides the user with the possibility to perform the most complex creative tasks. The exposure metering is made with the 420-segment RGB sensor, enabling to accurately adjust the exposure. The D80 inherited the autofocus system, based on the Multi-CAM 1000 module, from the D200. The location of 11 focus points is thought out in such a way that the field of the frame is covered to a maximum. The point or points of the focus group can be selected manually or automatically. The D80 range of sensitivity is very wide and implies the setting from ISO100 to ISO 1600, and in case of emergency it can be set up to the values of ISO 2000, 2500, or 3000. The Nikon D80 is the first among digital SLR cameras, which operates with SD memory cards, and support of the SD-HC standard allows using cards of more than 4GB. The Nikon EN-EL3e battery has an increased operating life, its full charge, according to the manufacturer, is enough to take about 2,700 shots. The Nikon D80 exceptional combination of superb image quality, speed, accuracy, flexibility, reliability, creative opportunities and comfortable design opens new promises in the world of digital photography.